Today’s Introduction to Electronics workshop was a blast. I was surprised by the turnout, since I hadn’t expected the class to fill up. Lots of people were interested, and we even had to ask some people to come to next month’s class. The students spent the two hour class pushing electrons around and experimenting with different ways of lighting LEDs. 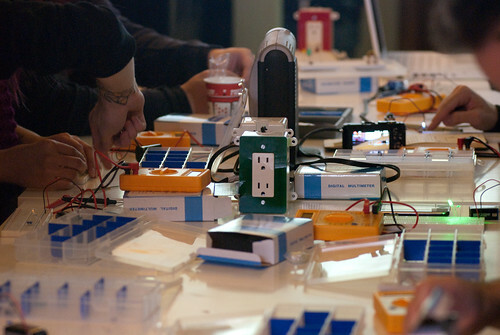 There were lots of interesting questions and playful experimentation, at the low cost of a few burned out LEDs. I had a great time teaching the workshop. Judging from the requests for a follow up class, the students had a great time too.